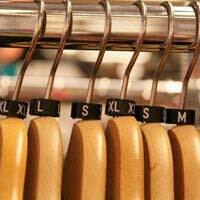 Home > Shopping > What's the Law on Clothes Labelling? When you look at clothes in a shop, the most important label that most of us - well, women anyway, are interested in is the size label. If you've heard of the term 'vanity sizing' you might already have an inkling that as far as the sizes of our clothes and shoes are concerned, there are no hard and fast rules that govern what a size 12 or 22 are. There's in fact nothing to stop a retailer from labelling all their size 16 dresses as a size 12 if they so choose. There is an organisation called Size UK in the UK that's been campaigning for standardisation of clothes sizes but as yet there's been nothing hard and fast agreed. Some of the bigger names in the high street fashion market have signed up to be part of the campaign but it's been suspiciously quiet in recent years. The law does still apply to clothes labels in some respects, and it's still part of the Sale and Supply of Goods Act that clothes must be 'as described'. So, although the manufacturers and retailers can't yet be accused of misdescribing an item on account of its size - because there are no legal definitions for clothes sizes, they can still be held to account if they describe an item as being '100% silk' if it isn't. If you buy an item and suspect that it isn't as described, you do have every right to ask for your money back. The only issue of course is proving that the label is incorrect, as a suspicion that the fabric is wrongly described isn't really enough to go on when trying to reject an item. You have to be able to show that the description is wrong. This is another area that can cause consternation with clothes and fabrics. If you purchase an item of clothing on the basis that it's machine washable, but when you wash it faithfully according to the instructions, it comes out of the washing machine looking like a little screwed up rag, you could be well within your rights to march back to the shop and point out that the care instructions are clearly incorrect and you would like a refund or a replacement. This strategy is only likely to be effective if you absolutely did wash the item as instructed, and it was the first wash. Most retailers will err on the customer's side and give a refund, exchange or credit note just for the sake of customer relations, but make sure you have some proof of purchase to back your case. The Sale and Supply of Goods Act applies here too in that the care instructions on a label are considered part of the description, and so if the item is described as being suitable for dry cleaning (or any other method of cleaning) it should be. Your only issue is likely to be proving that you followed the instructions properly. Hi. I have bought a pack of 4 baby bibs with assorted designs and colours. Although the 4 bibs are part of the same pack, only one bib contains a care label. Is this acceptable in the EU/UK? Emailed H&M regarding their sizing, as a purchased a pair of trousers that were supposed to be a size 12.They are stating that a Euro 38 is a size 12.I have imformed then that 38 is a ten, and shown them evidence from numerous shops and online conversions that show you this fact.Who's right, I'm sure I am. Emailed H&M regarding their sizing, as a purchased a pair of trousers that were supposed to be a size 12. They are stating that aEuro 38 is a size 12. I have imformed then that 38 is a ten, and shown them evidence from numerous shops and online conversions that show you this fact. Who's right, I'm sure I am. I have bought a top via an eBay outlet store, of a UK online shop. It has no care label, only a size label and a swing ticket. Is that allowed? My daughter has bought 4bridesmaids dresses from a UK company online.The dresses are of extremely poor quality and badly made and in fact look nothing like they do on their website.Their factory is in China and the dresses have NO labels on whatsoever so we cannot see any care instructions or fabric content.Is it a legal requirement in the UK to supply such labels? I bought a pair of pyjama bottoms from boyes the label said size 16-18 but it's another label that has been stuck over the original label which says its for age 16 years. Surely this is false and I can get my money back. What can I do?? Unless the original label was wrong? Does the garment appear to be the right size? If not then take it back. I recently had my husband's traditional Asian wedding suite dry cleaned. The garment was ruined as the beading on the suite had reacted to the dry cleaning chemical. Is there any way to claim a refund from the retailer, Venisons Shirwani in Wembley, who incorrectly labelled 'Dry Clean only' on the garment? I have already visited the retailer with the damaged garment however the manager/owner has blamed my very experienced dry cleaners and refused to accept liability for the incorrect labelling. My dry cleaners have kindly offered to try salvaging the garment free of charge, however I feel this is quite unfair! Is there anything I can do? I bought an expensive goose down pillow 1 year, 3 months ago from Dunelm, and recenlty washed it per care instructions.I was extremely disappointed that after this, the pillow smelt terrible (a bit like a damp dog), although it was dried thorourghly in a tubmle drier and outside in a heatwave.I can no longer use it. I contacted Dunelm stating the Sale of Goods Act and asked them for a replacement.I have recently received a response from them stating that because it was outwith the 12 month warranty period, they had no obligation to offer a refund.I know my rights and that legal responsibility for faulty goods lasts for six years from the date of the contract, i.e. when purchased. (This does not mean the goods have to last this length of time, but this is the time limit that the law gives you to take legal action"). Instead of arguing over this, I have decided to inform everyone of their poor customer service and lack of knowledge in relation to the Sale of Goods Act.I for sure, will no longer be one of their customers! I went to pay for a ladies shirt on sale at M&S price £15 clearly marked and with sign above 50% off. I was told it was not in the sale and a marking error, the assistant went and removed all the shirts and I refused to buy this item. What rights do I have ? I bought a M&S PURE COTTON white shirt,and dyed it black. The dyeng was perfect but the stiching remained white, which means that the whole shirt is not pure cotton.